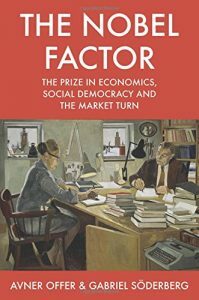 A comment on my post reviewing The Nobel Factor by Avner Offer and Gabriel Soderberg asked if the book covers the reasons Joan Robinson was never awarded the prize. There is a passing mention: “In the list of those who were denied the prize, it is difficult not to conclude that Robinson and Galbraith were kept out for ideological reasons.” Other non-winners in contention include, among others, Will Baumol, Zvi Griliches, Albert Hirschman, Moses Abramovitz, Harold Hotelling, Anthony Atkinson, Dale Jorgensen, Partha Dasgupta, Nicholas Kaldor and – the other woman – Anna Schwartz. A mixed bunch, some still alive of course. I also received an interesting email from Helmut Lubbers, who pointed me to this review of the book from a heterodox perspective. It is of course true that although there has been great variety among the winners, to a degree that you can’t label it 100% mainstream, neither has it rewarded heterodox economists.